Hong Kong "InternationalTrading Company" Advisory Service | AsiaBC HK: Register Company. Open Bank Account. Save Tax. AsiaBC assist clients to set up Hong Kong companies as re-invoicing center, the subsidiaries to invoice the internal transactions between multinational trading routes of an international trading company. It is a proven and simple method to optimize tax burdens for both Hong Kong and overseas companies. International trading is the business operation of purchasing goods in the manufacturing countries where production cost is low e.g. China, India, Thailand etc. and selling them to distributors in high-income regions, the actual trading operation may take place from a third jurisdiction. The goods bought by the trading company are shipped directly from the manufacturing countries to the consuming countries. 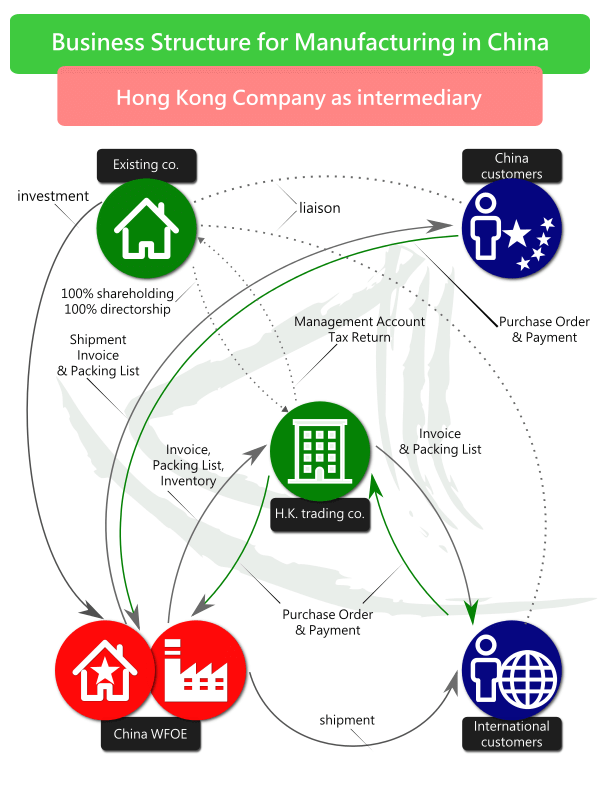 To significantly improved profits, the trader can form a company in a free-trade and low-tax jurisdiction like Hong Kong, this Hong Kong low-tax company will be used as an intermediary for buying, shipping, and selling the goods, it bills and pay all invoices in Hong Kong and then re-invoice the affiliate distributors in other countries, so most of the profits generated in the above trading operations will be retained by this intermediate company; Otherwise, the profits would be liable to profit tax under the countries where the goods are sold and trader’s home country. Why Hong Kong as hub of international trading? Reducing risk exposure – As the Hong Kong incorporated company is a limited liability company, the foreign investors’ liabilities is limited to the amount of share capital injected in the Hong Kong company and will not be personally liable. Rule of Laws – The law of Hong Kong is based on the rule of law and the independence of the judiciary from mainland China. The constitutional framework for the legal system is provided by the Hong Kong Basic Law. Simple tax regime – Hong Kong’s territorial basis tax system enable Hong Kong companies to be a zero-tax intermediary structure in your international trading business if profits are not sourced from Hong Kong. Simple setup – 100% shareholding and directorship by foreign individuals or corporates are allowed. Hong Kong is the world’s 13th largest trading economy. Free trade policy – Hong Kong does not impose any tariffs on the import or export of goods. Free flow of capital – Hong Kong has no capital control policy, money can move in and out Hong Kong freely. Minimal barriers – import/export licensing imposes to items related to public health, safety and security. Strategical location – Hong Kong is the gateway for entering and sourcing in Mainland China. China’s accession to the WTO – Hong Kong and foreign companies have greater access to China’s market in trading business. For those traders who buy products from suppliers in China and sell to home market as wholesalers or through their retail outlet, they can directly deal with Chinese suppliers for small quantity trade. When this trade route expands, the investors should need an international presence as an additional layer to enable their customers to buy FOB from China for tax efficiency planning. 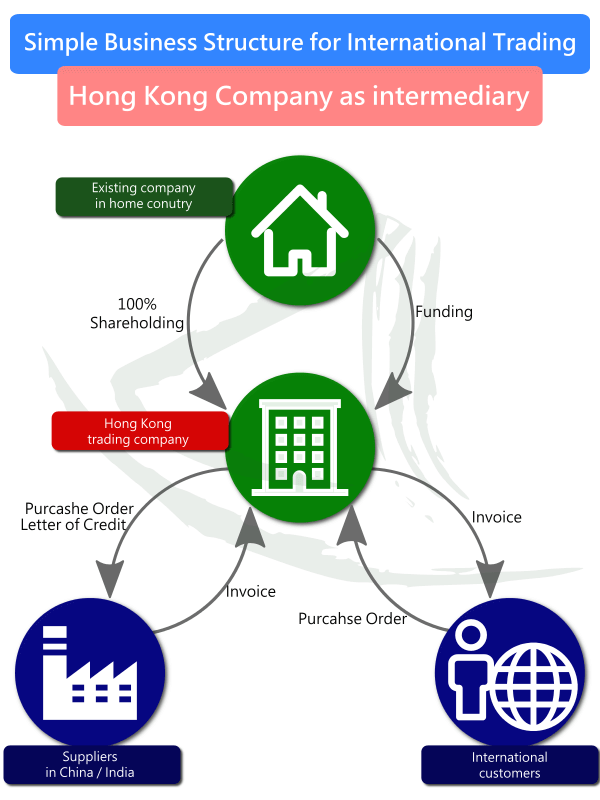 Incorporating a fully owned hong kong company as a trading intermediary, by which the Hong Kong Company is a re-invoicing center for purchases from China and other Asian countries and retain the profit in the Hong Kong company at 16.5% on the profit (preferable) or at zero-tax when if the profits are not sourced in Hong Kong (less preferable, it will likely be taxed in their original home country). The Hong Kong company (either a physical presence or a virtual office in Hong Kong is possible) handles all the trading services including PO’s, LC processing, banking, and shipping documentation between clients and China suppliers. AsiaBC can register Hong Kong limited companies based on your requirement of international trading, please refer to our Hong Kong limited company formation service. Foreign trading companies have been increasingly establishing their own manufacturing base in low-cost countries e.g. China to secure their control of supply chain and to enable themselves to sell into local markets (particularly China). In China, the manufacturing plants invested by foreign companies are established through arrangements of Joint Venture or direct investment through the establishment of a Wholly Foreign Owned Enterprise (WFOE) in conjunction with a local representative. As the Hong Kong company is acting as re-invoicing center and handle the trading services. AsiaBC can assist you to set up WFOE in mainland China, please refer to our China WFOE formation service for details. When the foreign companies decide to hire local staff in China in addition to having a trading company in Hong Kong, a Representative Office (RO) is the easiest and most economic way of setting up a legal entity presence in China. It is an office of a foreign a legal entity set up for only the liaison purpose with China suppliers and customers on behalf of its parent company and are strictly restricted from carrying out direct revenue earning business activities, i.e. invoicing, since RO is not a separate legal entity from its parent. Setting up a China RO by a Hong Kong company would be an advantage to the parent company since Hong Kong company is a separate legal entity and it takes this liability away from the parent company. Although a China RO is liable for filing and paying Business Tax, Foreign Enterprise Income Tax and Individual Income Tax based on your expenses generated by your indirect operation in China which is approximately 10% of your expenses. In addition, Stamp Tax is required for all signed contracts including your lease contract will require a Stamp Tax which is approximately 0.01% of the rent. AsiaBC can assist you to register RO in mainland China, please refer to our China RO formation service for information. The Hong Kong trading companies can handle all purchase issues with the supplier and the customer, while China ROs can act as the sourcing and quality control liaison office, for the negotiations, contracts, production and quality control issues. Asia Business Centre is a corporate services provider based in Hong Kong to offer a full range of incorporation, taxation, and immigration handling for worldwide investors to realize effective international trading operations in Hong Kong. Feel free to contact us for matters e.g. Hong Kong company incorporation, business centre, Hong Kong tax & accountinge, China WFOE formation, China RO setup.